A few people this year have told me that the day after Christmas is the saddest day of the year for them - all of the hustle-and-bustle of Christmas is over, and today is such a letdown. Personally, I am fairly anti-hustle-and-bustle in general, so I don't mind. After all, we still have leftovers. Plus, if you were nice all year (and Christian), you should have some gifts to play with. 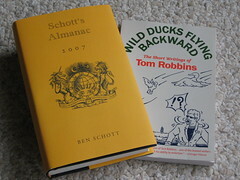 This year, among a few other things, I got two books, Ben Schott's Schott's Almanac and Tom Robbins' short story collection Wild Ducks Flying Backward. I also got a Canon PowerShot A540 digital camera. I figure having my own camera will make updating my profile on flickr a bit easier (so here's to entering the Information Age, one baby step at a time). Anyway, I hope you enjoyed your holiday, if you chose to celebrate one.